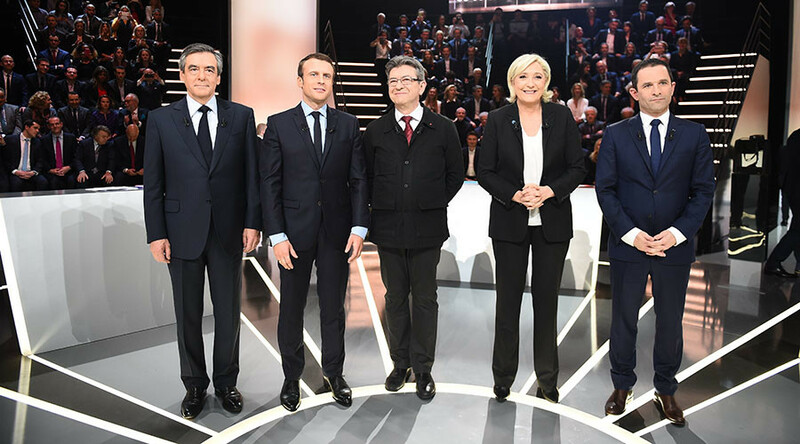 During France’s first presidential debate on Monday, the leading five French presidential hopefuls traded punches on the most burning issues, ranging from immigration and Islamization, to the country’s alliances and its very sovereignty. The timing of the debate, a month before French voters head to polls for the first round of the elections, provided candidates with a perfect opportunity to swing public sentiment in their favor. It was aired live by French channels TF1 and LCI. 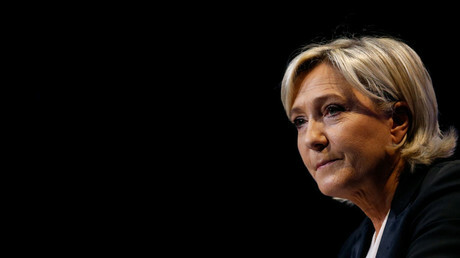 While a total of 11 candidates will take part in the first round of the presidential elections on April 26, the five front-runners include Francois Fillon from the ‘Les Republicans’ party, Marine Le Pen of the far-right National Front, independent centrist candidate Emmanuel Macron, Benoit Hamon of the ruling Socialist Party, and the left-wing leader of the ‘Unsubmissive France’ movement, Jean-Luc Melenchon. Macron, whose is pro-EU, rejected the idea of Frexit, arguing that Brexit turned out to be a much more tumultuous process than its backers had expected. “All those who said Brexit will be wonderful... ran away and hid,” Macron said. The debate on the migration crisis and the consequent challenges of integrating newcomers, which was one of the central topics discussed during the three-hour-long event, saw the candidates resorting to personal attacks at times. 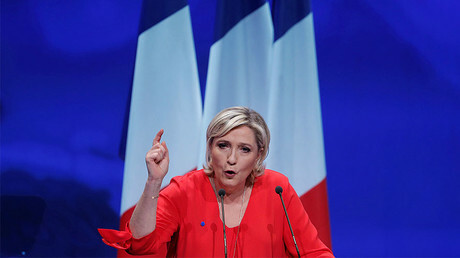 Former Economy Minister Macron, Le Pen’s centrist rival, argued that the unending flow of migrants can only be stemmed through more cooperation within the EU. “We don’t do enough to coordinate the protection of European borders,” Macron said, calling for a buildup of security forces and the creation of an “effective expulsion policy” in France. Another hotly contested topic was the contention that French secularism is under attack and that Islam is having a negative effect on the life of French citizens. The burkini, a head-to-toe swimming suit, grabbed a lot of media attention in France last summer, when some French city councils sparked uproar by banning them. The candidates also proposed differing geopolitical strategies, particularly regarding relations with Russia and the US. Macron, a centrist, cautioned against building closer ties with Russia, while pointing out France’s long-standing relationship with the US. Claiming that France and the US “have built the world peace together,” he advocated for “more independence” in the foreign policy realm, without getting closer to Russian President Vladimir Putin. Meanwhile, Hamon seemed prejudiced against both Russia and the US, which is now led by President Donald Trump. “We are facing the instability that emerged with the election of Donald Trump as the president of the United States. We also cannot ignore the claims of Russia,” Hamon said. “I don’t want to force our soldiers to make war that we don’t need,” she said, referring to overseas conflicts. Speaking about the right to self-determination exercised by the people of Crimea when they opted to rejoin Russia in a referendum held more than two years ago, Francois Fillon acknowledged that “we [Europe] have changed borders ourselves,” referring to NATO’s intervention in the war in Yugoslavia in 1999, which resulted in the country breaking up and the separation of Kosovo from Serbia. “There is a fundamental principle of the right of people to decide for themselves. There are borders that have been established in a way, unacceptable for people,” he said. Macron came out as the most persuasive in the first debate, according to a BFMTV poll. Out of 1,157 people polled, 29 percent preferred Macron, 20 percent picked Melenchon, while both Le Pen and Fillon were favored by 19 percent. Before last night’s event, he had been running neck-in-neck with Le Pen, with both polling at 26 percent in the latest Figaro poll.